The human brain is remarkable. In comparison to other animals, the brain is seven times bigger than it should be for the size of the body. During evolution, it enlarged in a rather short amount of time allowing humans to surpass other primates. Researchers now have insight into the human advantage and ways to optimize the brain. We will explore these findings as well as the intricate functions of the nervous system. The information also includes helpful links about disorders of the nervous system and the tips to optimize brain and prevent injury." April is Parkinson's Awareness Month! 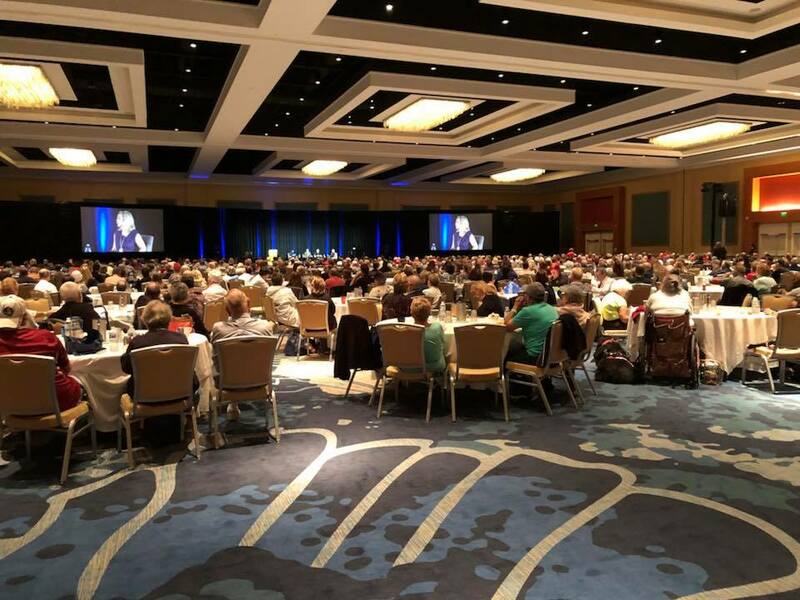 Florida Hospital and the Parkinson Association of Central Florida kicked off the month, with the Brain and Beyond Conference on Thursday, held in Lake Mary, where over 500 attended to learn about the latest trends in managing Parkinson’s symptoms and improving their quality of life. The conference featured physicians and researchers that provided positive messages to help manage this disorder. Parkinson’s Community Member, John Alexander Attends Parkinson’s Policy Forum in Washington, D.C.
John Alexander of Lake Mary, Florida will join more than 300 other advocates in Washington, D.C. on March 19 – 21 to meet with their Members of Congress to share their stories of the personal impact Parkinson’s disease (PD) has made on their lives and the lives of their loved ones. Delegates will educate lawmakers on the need for federal funding for research toward a cure for Parkinson’s, and policy support for those living with the disease. The Parkinson’s Policy Forum is co-hosted by the Parkinson’s Foundation and The Michael J. Fox Foundation for Parkinson’s Research. The event is also supported by nine other Parkinson’s organizations across the country. The 2018 Parkinson’s Policy Forum will feature two days of training, followed by one day of advocacy, congressional outreach and education to Members of Congress on Capitol Hill. John Alexander and other attendees will receive tools to develop and hone their skills for effective public policy advocacy as they prepare to meet with their senators and representatives. Attendees will hear from scientific and policy experts at the Parkinson’s Foundation and The Michael J. Fox Foundation on the latest developments in PD research. Panelists also will highlight recent legislative action to increase access to health care services, including the elimination of the Medicare therapy cap, which advocates worked for many years to remove. John Alexander will meet with Senator Bill Nelson and Marco Rubio; and Representatives Stephanie Murphy, Bill Posey, Gus Bilirakis, and Charlie Crist and their staff to talk about the need to provide federal funding for Parkinson’s research programs at the Centers for Disease Control and Prevention, National Institutes of Health, and the Department of Defense. The Parkinson’s Policy Forum is an annual event for people with Parkinson’s and their families, care partners, and friends who are interested in public policy advocacy. Advocates from nearly all 50 states convene in Washington, D.C. for educational sessions, and meet face-to-face with their Members of Congress and their staff. John Alexander is a sought after inspirational speaker, focusing on resilience and overcoming challenges. John also serves as an Ambassador for the Davis Phinney Foundation for Parkinson’s, an organization whose mission is to help people with Parkinon’s to “Live Well Today.” John is the author of a book about his experience living with Parkinson’s Disease, entitled, “The Journey Begins With 1,000 Miles – Thriving With Parkinson’s Disease through Hope, Optimism, and Perseverance.” He resides in Lake Mary, Florida with his wife of 43 years, Laura. This article was taken from a quarterly published newsletter from a collaborative effort of the Florida Hospital Parkinson Outreach Center, the Parkinson Association of Central Florida, and Bioclinica Research. Our three organizations are committed to raising awareness offering programs and resources for those living with the disease, and furthering the research of new treatments. In this issue, you will find information about research news, program news and upcoming events, as well as ways for you to get involved in clinical trials that open the door to new and advanced treatments. This collaboration is just one of the ways our three organizations seek to better connect the PD community to valuable information, resources and important, cutting-edge research. Sunovion Pharmaceuticals Inc. (Sunovion) is currently developing a new educational initiative and is seeking people living with Parkinson’s Disease who may be interested in sharing their experience with others living with Parkinson’s, as well as with care partners and healthcare professionals. Your insights and perspectives may potentially help shape patient programs and services that are intended to support, inform, and empower the patient community. Sunovion is working with a partner agency that will help train people living with Parkinson’s, and/or their care partners, to share their experiences in patient-to-patient initiatives that comply with FDA, legal, and regulatory guidelines. Those who participate will receive an honorarium and reimbursement for travel expenses for their time spent participating in the event. Mary's story was featured in the Orlando Sentinel. Click HERE to read her full story. Mary was diagnosed with Parkinson’s almost 3 years ago and lives with her husband Pete. She learned about the Walk through research and attending educational seminars including the Partners in Parkinson’s event when it was held in Tampa. Shortly after, Mary learned about an organization here in Orlando (Parkinson Association of Central Florida) helping those with Parkinson’s and decided to reach out. As soon as she knew there would be a Walk in the spring of 2017 Mary decided she wanted to be involved. She first created her team and talked to some of her friends who fundraise for other organizations. They encouraged her to reach out to family members and friends to support her fundraising efforts. Each of them was very generous in their donations and enjoyed showing support. Mary was humbled by the response she received from her fellow crafters at St. Stephens in Tuscawilla and had 90% of them contribute to her team. Like many, when Mary was first diagnosed she felt helpless knowing the progression would continue as time went on. She feared that there would come a day when she would no longer be able to walk. Through Mary’s research she was able to learn about different medications, treatments and exercise that could help slow the progression. Fundraising is a huge key to unlocking all of the information we know today. Through the Walk for Parkinson registration Mary found it was easy to keep track of donations because she would receive an email each time someone had contributed to her team. Each donation was also posted to her team page listing those who showed their support. Each time she received a donation she used the built in email feature to send a quick thank you, then followed up with a phone call or was able to thank them in person. Last year, Mary Tabler was ranked 4th on the top teams list and raised a little over $3,000! This year Mary has set her goal at $5,000 and has already created her team. Along with the event of the Walk, she has invited friends from out of town and plans on celebrating her 70th birthday. Another personal goal Mary has set for herself is to continue to pursue her physical therapy and walk this next Walk. The previous year her husband pushed her in her wheelchair because of serious pain in her right hip. At the moment Mary is walking and plans on continuing her progress to accomplish her goal. 2018 kicks off the Walk for Parkinson! Registration is now open and you can create a team and start fundraising. To help your team reach the top of the fundraising board we've provided a list of different fundraising ideas to help get you started! Raise awareness for Parkinson's by purchasing a PACF t-shirt. Not only will you raise awareness, but also give back to Parkinson's disease. Each shirt should be delivered to the address you request. Shop on Amazon and use AmazonSmiles for your holiday purchases. Amazon donates .5% of your total purchase to PACF. It's as easy as that! Make a general donation to PACF and help continue to fund research, provide caregiver support, wellness classes, and educational lectures. Through these activities, we work directly in our communities to fulfill the commitment to our members. Faces of Parkinson's - "Don't Worry, Be Happy"
Meet Marianne McClain Popkins! She and her husband, Ned, are high school sweethearts from Connecticut who have been happily married for 39 years. They’ve lived in Orlando since 1984, where they raised three sons: Taylor (34), John (31) and Duncan (23). Marianne, who majored in art history and minored in history in college, worked at Yale University in the slide-and-photograph collection and at the Wadsworth Athenaeum in Hartford (the nation’s oldest public art museum) in the art-education department – until Ned, a career journalist, dragged her off to Central Florida, where he worked for 29 years at the Orlando Sentinel as an assignment editor and newsroom manager. Marianne fell into the child-care business upon arriving in Orlando; she started as a part-time “toddler teacher” but was soon managing three day-care centers. When her bosses left to start a private school in Maitland (the Kenworthy School, now Lake Forrest Prep), she served there for almost a decade as director of family services. But she returned to her first love, art and history, when she was hired in 1999 as the first executive director of the Winter Park Historical Association and Museum. Over the course of a decade, she helped organize more than a dozen exhibitions, produced monthly membership programs, and managed both an extensive archives and the museum inside the Winter Park Farmers Market. She switched gears again in 2009, opening an adult day care center for people with dementia in College Park for Share the Care, a local nonprofit that supports home-health caregivers. Ironically, it was at Share the Care that Marianne first noticed the seemingly unrelated symptoms that eventually led to her diagnosis of Parkinson’s in April 2013. By then, she had had to retire from Share the Care for shoulder surgery; now, four years later, she is largely dependent on her husband for everyday activities and getting around – after a problematical surgical trial at the University of Florida revealed that she probably had an “atypical Parkinsonism” called Multiple System Atrophy. So Ned, who once attended Share the Care events as the spouse of a center director, now attends them as a caregiver who receives respite assistance from the agency. Marianne and Ned, always very active outdoors, have tried to remain that way even with Parkinson’s. Marianne, who played varsity field hockey in high school, ran the Orlando OUC Half Marathon in the mid-1980s and as recently as 2013 was a member of the Edgewater Crew masters rowing team in College Park. Although she can no longer stand or walk without assistance, she continues to pedal her high-performance, recumbent tricycle around the neighborhood, and she’s learning to use both a high-tech walker (called a U-Step II) and an electric wheelchair to get around Lake Eola Park, where she and Ned moved earlier this year after 32 years in College Park. Marianne also enjoys reading – and baking. (Ned likes to point out, much to Marianne’s annoyance, that she was their high school’s 1973 Betty Crocker Homemaker of Tomorrow!) Most of her baking now consists of cakes, cookies and pies, but her favorite recipes initially were breads; the first year she and Ned were married, she made all they bread they ate each week from scratch – until they started gaining too much weight! Even before the UF surgical trial in early 2016 worsened her Parkinson’s symptoms and led to the MSA diagnosis, Marianne had been getting outpatient physical, occupational and speech therapy at Florida Hospital as needed. Thanks to her and Ned’s interest in bicycling, she also found a program called Pedaling with Parkinson’s, an exercise program and social group based in the Crosby Wellness Center in Winter Park. That led her and Ned to Florida Hospital’s Parkinson Support Center, where they have become regulars not only at the Orlando support group but at several of the center’s other programs; like the cycling group, they offer valuable socialization – connecting with others facing similar circumstance – as well as group therapy for Marianne, caregiver respite for Ned, and the latest Parkinson’s information for both of them. Marianne’s positive outlook – “Don’t worry, be happy,” she says – helps her manage the stress of dealing with a progressive disease. She chooses to focus each day on enjoying her family and friends as best she can. Her advice for those recently diagnosed: Don’t wait for a doctor to draw you a map or direct you to all the groups and services available; chances are the doctor will prescribe one or more appropriate medicines, and perhaps some therapy, but it’s up to you to look around, do some research, and tap into your local Parkinson’s community and any specialists, medical trials or educational resources available. “The more you get involved, the more you will learn about your illness, yourself, and the many opportunities you have to succeed,” she said. In October the Michael J Fox Foundation chose Orlando to host Partners in Parkinson’s educational seminar. This free event had over 1,200 people in attendance from many cities and states across the nation. The event’s resource fair included several national organizations, care centers & trial sites, allied healthcare providers and local resources. Among those included Florida Hospital Parkinson Outreach Center, Bioclinica and the Parkinson Association of Central Florida. Several Central Florida community members were represented and spoke on a variety of different panels. PACF Board Member, Don Bartlett, Nydia Burgos and Advisory Board Member, Tonya Walker were represented in the morning panel, The Many Faces of Parkinson’s. John and Dorothy Gabriel provided information on Seeing a Movement Disorder Specialist lead by Dr. Soania Mathur. In the afternoon Anissa Mitchell, LCSW Florida Hospital Parkinson Outreach Program Manager, Nettie Levett and Richard and Kathi Wells were represented during the You, Your Loved One and Parkinson’s Disease. Each panel helped provide a different perspective on Parkinson’s and many ways on how to manage it. Partners in Parkinson’s helped provide resources and education to the public and helped shed light on the importance of resources in the community. Local organizations, such as the Florida Hospital Parkinson Outreach Center, Bioclinica and Parkinson Association of Central Florida who are dedicated to working hard to provide resources and research to the community and to one day find a cure.